World famous chef, international restaurateur and the host of a gazillion hit reality television shows, Gordon Ramsay is back in the field hunting for his protein again. After hunting and butchering a hog earlier this year, Ramsay gave deer hunting a try in Norfolk, England. 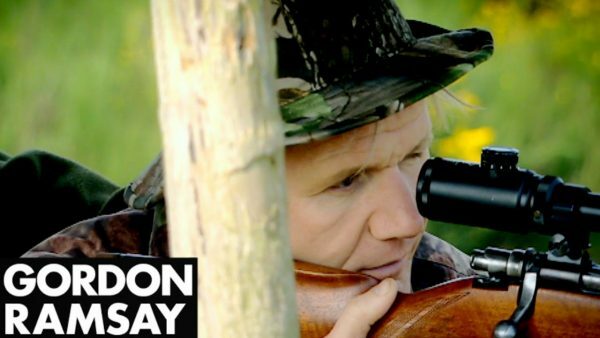 In a scene posted to Youtube from an episode of the UK-based Gordon Ramsay’s The F Word, he takes viewers through his preparation for the hunt and the stalking of a wild deer, something he’s never done before. After taking target practice the day before, Ramsay cooks up a simple liver and onions dish. Now that’s something Gordon can master. The next day he and his guide track deer early in the morning and then hole up in a stand where they have a long vantage point in several directions. It looked like he didn’t have a great shot. The deer kept moving, but Gordon was discouraged. “I don’t know, maybe I’m becoming a vegetarian,” he said. To find out how his deer hunting trip eventually plays out, you’ll have to tune in to Gordon Ramsay’s The F Word on Hulu and other cable providers.